Juice is a great way to dramatically improve your health, but some people just want to drink juice because it tastes so good. Why not drink a juice that both tastes good and is still packed full of vitamins and minerals? Blackberries and kiwi are both considered super foods. They are low in calories but extremely high in nutrients. Kiwi is high in Vitamin C, E, K, magnesium, copper, and potassium. Blackberries are filled with Vitamin C, and offer high levels of antioxidants. Because both of these fruits are very strong in flavor, it is easy to sneak in nutrient dense greens such as spinach or kale. Your kids will never know they are there. Because blackberries and kiwis are tart, you should add a milder fruit such as apple or pear to tone it down a bit. Wash all ingredients before processing. Peel kiwi and pineapple. Remove core from pineapple. Cut everything into pieces that can be easily fed into the chute of the juicer. Feed Spinach and mint through the juicer at the lowest speed. 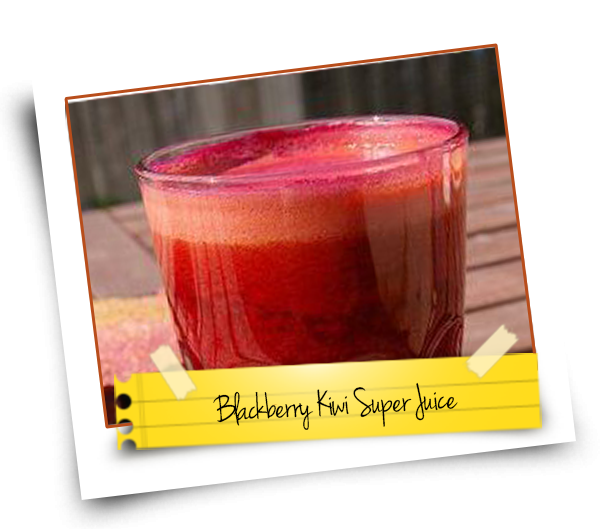 Increase juicer to the highest speed and feed in blackberries, kiwi, pear, and pineapple. Makes approximately 12 ounces of juice. Tip: This juice can be very strong due to the strong flavors of the blackberries and kiwi. If you find it to be too strong for your tastes water it down with approximate 4 ounces of water. You can also add a few drops of stevia to sweeten this juice up if it is a bit too tart for your tastes. 1) Omit mint and add a one inch piece of ginger. 2) You can substitute an apple for a pear, but be sure to use sweet apples such as reds or golden apples. Tart apples will only add to this already tart drink. 2) Make a blended smoothie by adding juice and 2 cups of ice cubes to a blender and blend until smooth.